✅ Trip Verified | New Delhi to Guangzhou via Qingdao. Shandong Airlines maybe ok in China but internationally it is pathetic and has most callous and careless staff and is not worth flying. In Delhi this is the only airline which does not have a desk at the international airport, where passenger booking related issues can be looked into and sorted. On my last journey this airline caused extreme inconvenience to me and my wife. They changed my name in their system at backend and on reaching airport I was denied boarding as the name on my ticket and in this airline system was not matching. The mistake of changing my name entirely was identified to be committed by Shandong airlines staff. They changed my first name and denied me boarding. The ground and city ticketing staff was rude and most inconsiderate with their concern only in separating my wife and me at time of flying. On return, from Beijing to New Delhi, I confirmed with their staff a day prior for any issues in my return ticket so I do not face such surprises at Beijing airport again and that too in China where language is a big problem. I got an ok from the airline. However, at check in counter, I realized this airline staff had now put my passport number wrong in the system and caused us panic at 11 in the night. They are considered by a section of international passengers only because they are cheap and have a higher baggage allowance, otherwise this is a pathetic airline. Best to be avoided and rather fly more renowned airlines in future. "would never choose it again"
✅ Trip Verified | I booked Shandong Airlines Xiamen to Chengdu. After booking, I log in to the app self-service check-in every day. The result is not open online check-in. Arrived at the airport at 5:24, the airport self-service machine could not be checked in. I went to the economy class counter. At that time, I showed the L11-L15 counter. I only opened two counters. When I arrived, I told me that I was late. For three minutes, I requested to apply for the check-in. If I didn't, I went to the window. The duty officer told me that I couldn't solve it. I can only refund the ticket or the afternoon flight, and I can't transfer other airline flights. After that, I can still contact the official website. The same answer. Due to urgent circumstances, other airlines will continue to fly to Chengdu and refund the ticket at the Shandong Airlines app. First of all, the Shandong Airlines app can't be unreasonable in advance. The airport self-service check-in is still unable to handle the self-service check-in. The same is the problem of Shandong Airlines or the problem of Xiamen Airlines Airport. No counters were added in the case of a large queue of check-in queues at the counter. In the case of my advance, I was unable to check in the airport and Shandong Airlines. Secondly, why can't I sign another airline, I also proposed that the payment to sign the mountain customer service still refused, during which the airport staff of Shandong Airlines Xiamen told me If you go to Ctrip where you can buy it, you can sign it. Isn't this the overlord clause? For the sake of trust, the official app booking is not as good as the agent? Strictly request to return the ticket price!! After I dialed 12315, the Xiamen Airlines staff told me that they were not prepared to refund my money, and I deleted the app refund application without my consent. I would never choose it again. "stay away from this company"
✅ Trip Verified | Guangzhou to Shanghai. A bad airline at the level of the third world. Flight was delayed without explanation for passengers for more than two and a half hours. No information was given. It was also not known how long the flight would be delayed. We had to make a follow-up flight, because of the lack of information we could not call and announce when it was coming. According to the IATA Regulations, the airline must assist in the event of a delay. The flight itself was in an old-fashioned old-fashioned airplane, broken chairs, uneven, and tattered. A ridiculous meal that even on an internal cabin flight was a better meal. Of course, the company did not apologize to the passengers for the back, did not provide a team to deal with the consequences of the rear, and completely ignored the passengers and the damage caused them. This is the first and last time I fly with them and recommend that everyone stay away from this company. ✅ Verified Review | I traveled from Guangzhou to Jinan and I was happy with the service. The airline even replaced my suitcase that broke during the flight. Calling Shandong Airlines and deal with their customer service was not a pleasing experience. The customer service lady was unprofessional. When I asked questions, she would not reply to me and she eventually hang up. Bad customer service personnel. She did speak English but constantly ignores my questions. 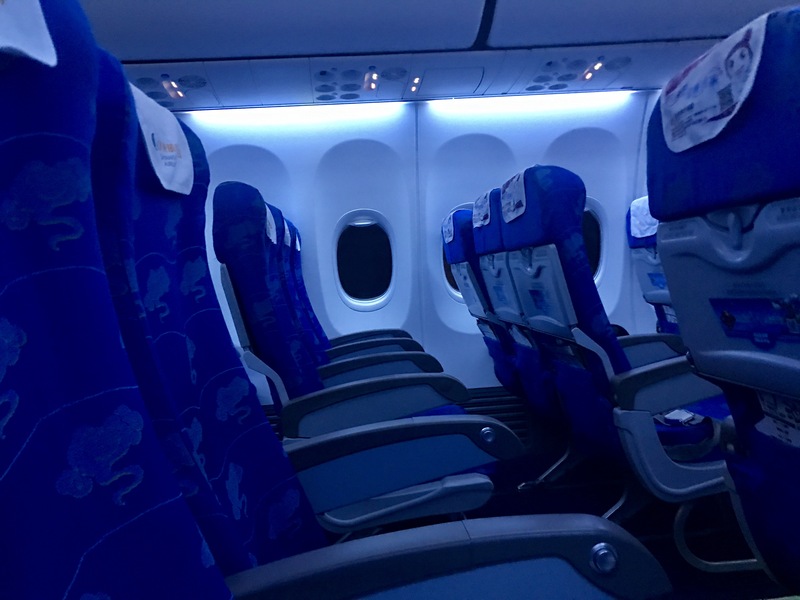 ✅ Verified Review | With flights starting at around 120 USD between Seoul and Yantai, Shandong Airlines proved to be the cheapest option (beating Asiana, China Eastern and Korean Air). Given the price I was a little hesitant to believe the service to be of a high level however I was pleasantly surprised. I was given a friendly greeting in English on boarding, crew holding a basket of sweets for passengers to take as they headed to their seat. For the rest of the flight the crew seemed to conduct their service pleasantly with a smile. On the outbound flight to China apple chips and bottles of water were offered however on the return leg a delicious hot meal was offered consisting of a sweet and sour type meat dish with rice. Highly surprising considering the flight time was less than an hour. Interestingly, on both flights the captain performed a detailed speech in Chinese and English. 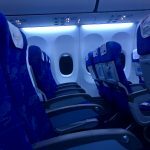 Despite the fact that the Boeing 737-800 was several years old, it was fitted with Boeing's Sky interior and its interior seemed to lack any signs of wear and tear. The interior including the toilets appeared to have been cleaned well. The seats were comfortable and had ample legroom for the short flight. The IFE onboard consisted of overhead screens, these played the moving map on the outbound flight at Mr Bean on the return journey. Overall a good journey! 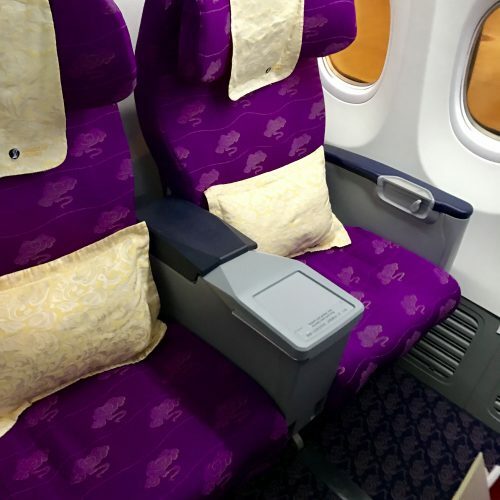 "comfortable, clean and modern plane"
✅ Verified Review | Beijing to Weihai with Shandong Airlines. Comfortable, clean and modern plane with ample leg room, far more generous than Etihad and the other 'premium airlines' I have experienced. Some delay due to air traffic congestion, however bags promptly delivered on arrival. Water provided by friendly and attentive crew for the short flight. Surprisingly nice flight for a Chinese airline. The business class (named first class) is of the usual type in China, i.e. 2 rows of 4 seats, with old seats and small reclining angle. The crew was very attentive, wine (Chinese) was decent, and so was the food, nothing special but ok. Reading material is of course restricted to the China Daily, and there is no individual entertainment, but, on a 4 hours flight, especially on a night flight, this is not essential. Flights both ways were on time. I would recommend this flight, as it is the only airline to fly directly between Bangkok and several places in the Shandong province; schedule is terrible, but it is still better than transferring. I have now been delayed more than 38 hours for my original flight from Guilin to Chengdu the 8.50am flight on 15th May 2015. There was bad weather at Guilin airport so we (there are 2 of us both western) were sent to a hotel in Guilin. We waited at the airport until 16.00pm for this service. Shangdong Airlines then failed to tell us that the flight was moved to 02.00am so we stayed in the hotel and missed this flight. Today we finally had our flights changed to CA4324 and we were promised 1st class tickets to Chengdu in way of some small compensation for the extreme delay. This was arranged by a Chinese speaking friend with Shangdong Airlines directly. When we arrived back at the airport we were told that there were no 1st class tickets. So we've been delayed by 38 hours (almost 39 now) and now we've been lied to about our replacement tickets. This is the worst customer service I've received and obviously the longest delay I've experienced. From Xiamen to Nanjing. Flight was delayed 1 hour due to air traffic control. Served dinner 2 meal choices. Beef with rice or fish with rice. Also complimentary drinks served. Cabin staff were helpful and friendly. They tried to help all passengers. Nice trip. YNT-PVG new B737-8 mood lighting was used to great effect on this evening flight. Was pleasantly surprised to be served a rice dish (alongside a range of beverages) for 80-minute trip. Overhead screens every 2.5 rows for a programme that lasted about as long as the flight did.